Case 2. 4yo female with leg pain. 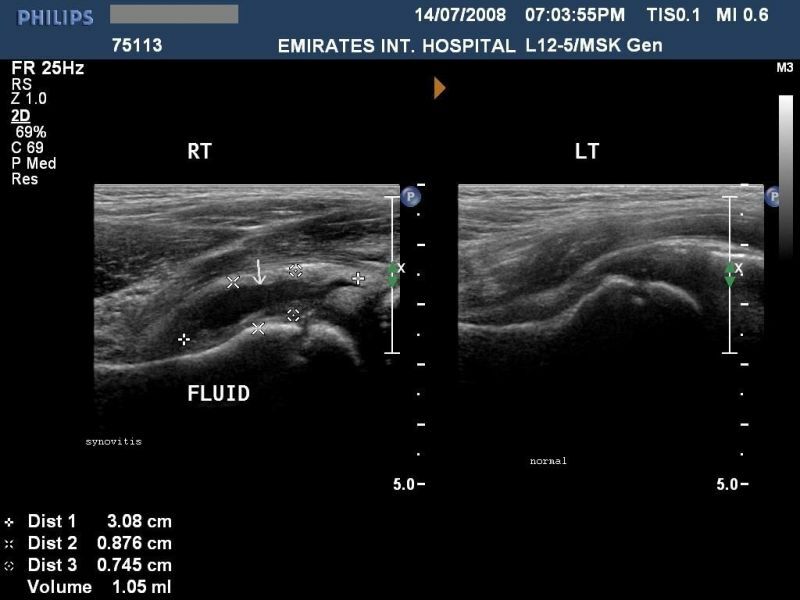 U/S shows small effusion of the hip. Labs all normal. Pt improved with po Tylenol/Advil. Diagnosis was toxic synovitis. Critical actions were to evaluate for septic arthritis, fracture, other boney problem, and leukemia. Ibuprofen is preferred for this malady over acetaminophen. Uncomplicated UTI’s : treat with cephalexin for 7 days or nitrofurantoin for 5 days. Creatinine clearance cutoff for using nitrofuantoin is above 60. Community Acquired Pneumonia that fails outpatient macrolide or beta-lactam therapy: Switch to moxifloxacin. Do not use Vanco/Zosyn unless patient meets HCAP criteria. Harwood comment: I use CAP (IV ceftriaxone/azithro ) antibiotics for this situation. For community acquired aspiration pneumonia, add clindamycin to ceftriaxone/azithromycin. Alternatively, moxifloxin could be used as single agent coverage community acquired aspiration. Moxifloxin has anaerobic coverage. Cellulitis: Basic cellulitis without complicating issues like DM, peripheral vascular disease, or healthcare facility associated infections can be treated with IV cefazolin or IV clindamycin. IV cefazolin has much higher tissue levels than po Keflex so a failure on po Keflex can still improve with IV cefazolin. You don’t necessarily have to go to IV vanco for Keflex failures. Avoid Vanco/Zosyn for run of the mill community-acquired soft tissue infections. MRSA doesn’t usually present as cellulitis so cellulitis does not need MRSA coverage. For early cellulitis in a diabetic, IV cefazolin is also a reasonable choice. For more severe infections (diabetic foot) cefazolin is not adequate coverage. Bactrim and Doxy both have 99% effectiveness against community acquired MRSA. Clinical judgment is required to determine if post-arrest patient will go to cath lab. In patients with multiple co-morbidities EM and Cardiology physicians will have to make a decision whether or not to go to cath lab post-arrest. New LBBB without typical angina symptoms does not go to cath lab. You have to have a new LBBB and a good history consistent with cardiac pain. Please give antibiotics for pneumonia prior to clicking “Dr. Done” CMS criteria look at antibiotics given in ED for CAP. To give HCAP antibiotics, document immunocompromise or that patient was hospitalized for 48 hours in the last 90 days. FirstNet now has an ED Stroke Alert powerplan. That’s the powerplan to use in the ED when managing a stroke patient. Goal to administer TPA for stroke is 60 minutes door to drug time at least 50% of the time. Door to CT goal is 25 min. Harwood comment: It is important to streamline registration process so that we can order tests/CT scans more rapidly. It would be optimal to have TPA prepared prior to needing it and dispose of it if not needed. Chan response: We had @250 Code Stroke activations and 41 of those received TPA. That would be a lot of TPA wastage. Kessen comment: At my new job, they use a digital clock in the patient’s room to count down the time left to give TPA in stroke patients or get STEMI’s to the cath lab. Please follow Restraint Order requirements very closely. Please time when the patient is actually placed in restraints. Make sure the restraints placed on patient match the order entered in FirstNet. CAUTI = Catheter associated UTI’s. You must document an appropriate indication for foley placement. This is an Advocate-wide priority to decrease foley catheter use/infections. Straight cath’s do not fall into this monitored category. You can straight cath multiple times instead of placing a foley. Multiple straight caths are preferred over indwelling foley placement. Burn Trauma: Have a low threshold to consult Burn Center. Pediatric Psych Patients: SASS worker does not have final say on whether a patient is admitted to a state facility. MD can override SASS recommendation and SASS worker has to find a facility for patient admission. 79 yo male with hyperkalemia and renal failure. Hx of AICD, HTN, AFIB, CAD, CHF. Initial treatment: Hyperkalemia management, IV fluids, Bicarb drip, foley placement. Pt went up to floor and it was learned that patient was digoxin toxic. Patient was transferred to the ICU and given digibind. Digoxin blocks the sodium-potassium ATPase transport mechanism leading to increased intracellular calcium and increased contractility. Digoxin increases vagal tone and slows done AV nodal conduction and decreases AV nodal automaticity. Digoxin increases ectopic beats. Clinical findings of digoxin toxicity: nausea/vomiting, lethargy, coma, nearly any dysrhythmia except rapidly conducted supraventricular arrhythmia. Ectopic beats like PVC’s are common. A common finding in digoxin toxicity is SVT with AV block. Bidirectional tachycardia is virtually pathognominic of digoxin toxicity. EKG findings with therapeutic digoxin levels are scooped ST segments in lateral leads. 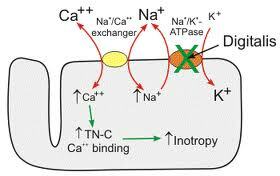 Hyperkalemia is common with digoxin toxicity. The degree of hyperkalemia is a better predictor of mortality than digoxin level or EKG findings. Treatment for digoxin toicity is digibind. Avoid class 1a antiarrythmics. Do not use procainamide in the setting of digoxin toxicity. Calcium administration in the setting of digoxin toxicity is controversial. There are a few case reports of death but most recent reviews show that it is generally safe to give. Indications for Digibind: life threatening dysrhythmia, K>5, chronic digoxin poisoning, Digoxin level >15. Carlson and Harwood comment: Probably digibind was not indicated in this case. The cause of hyperkalemia was likely mostly dehydration and worsened renal function. The fact that the patient had a pacemaker gave an extra margin of safety. Andrea would have kept the digoxin at the bedside. She would have arranged for dialysis. Andrea comment: As the emergency physician you have a responsibility to identify what meds the patient is on especially if the med list is not easily found. Harwood comment: Get a digoxin level in patients with hyperkalemia or if patients have slow afib. Asa is one of maybe two drugs that has been shown to unequivocally reduce mortality in AMI. The absolute risk reduction of ASA is 4%. The other drug that has shown mortality reduction is thrombolytics. New Research finding: Don’t give ASA pre-operatively (GI surgery, ortho surgery, gu surgery, cancer surgery, etc) to prevent cardiovascular complications. There is no benefit in MI prevention. Clonidine also does not work to prevent MI’s post-operatively. Asa has increased bleeding risk with no benefit in MI prevention post-op so don’t give pre-op. Criteria for benign early repol: widespread st elevation, j point elevation, concave up, notching of j point, concordant/prominent t waves. Girzadas comment: also has to be no reciprocal changes. Erik response: True but that is not included in the formal definition. Electrical alternans is kinda pathognomonic for pericardial effusion. This ekg finding has low sensitivity and high specificity. There was a discussion about whether this finding was truly pathognomonic. In medicine, the term sine qua non is often used in regard to any sign, symptom, or finding whose absence would very likely mean absence of the target disease or condition. The test for such a sign, symptom or finding would thereby have very high sensitivity, and rarely miss the condition, so a negative result should be reassuring (the disease tested for is absent). So my take is: sine qua non is highly sensitive and pathognomonic is highly specific. Stress testing: sensitivity is @80% and specificity is also @80%. The outcome stress testing is measured against is coronary stenosis on angiogram. If you identify a stenosis on stress testing, there is no mortality benefit of stenting over maximal medical therapy (smoking cessation, lipid management, bp control, exercise, anti-platelet therapy, weight control). New sea-change in cardiovascular management this month with the JNC raising BP goals for older patients to <150/90 and AHA recommending decreasing frequency of lipid testing. The only clear indication for an angiography/stenting to decrease mortality is in the STEMI patient. The classic diagnosict triad of aortic stenosis is chest pain, dyspnea, and exertional syncope. It is the most common valvular lesion in the US and about 3% of patients over age 75 have this problem. In patients with syncope and AS the 3 year mortality is 50%. In patients with dyspnea and AS the 2 year mortality is 50%. Treatment is surgery or now there is a Transcatheter Aortic Valve Replacement Therapy available. Heparin has 0% risk reduction for death in the setting of ACS. EKG’s frequently are ordered by persons other than the physician and they can be lost or not seen by the physician. EKG’s are frequently not in a patient’s chart when we go in to see a patient. We can forget to check the patient’s name on the EKG. Carenet plus has EKG’s stored electronically and the ED EKG’s can be accessed while the patient is still in the ED. Harwood comment: A reasonable system fix would be to have an EKG image or interpretation linked to the tracking board similar to lab and imaging results. Energetic discussion of solving these EKG problems ensued.